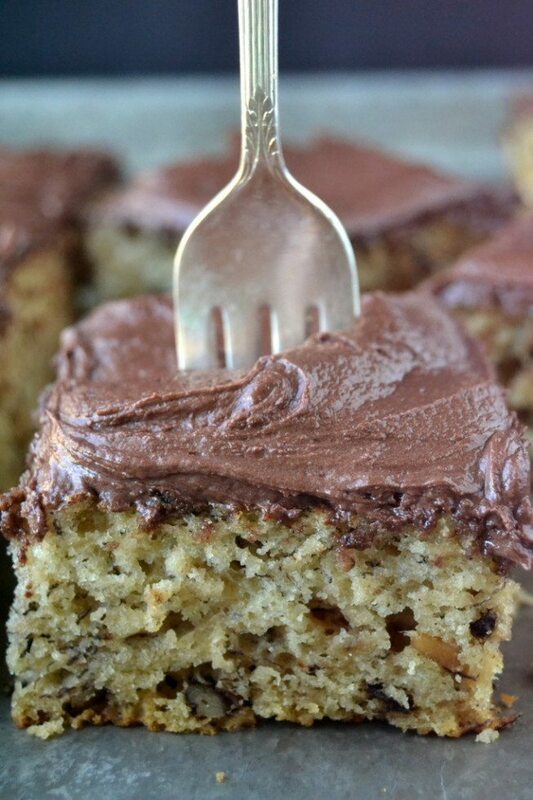 Banana Walnut Cake with Mocha Buttercream ~ this little banana snack cake is definitely a step above the rest! Begin by toasting the walnuts. Spread out the nuts on a dry baking sheet and put in the oven for 10-15 minutes, just until you can smell their aroma and they have crisped up. Watch carefully, and give the pan a shake or two during toasting. Let cool before chopping. Mash the bananas in a large mixing bowl. Be sure to get all the lumps. Beat in the eggs and the sugars, and then add the oil, buttermilk. and vanilla. Blend well. Sift the dry ingredients right into the bowl, and fold in lightly, just until everything is blended. Fold in the nuts. Spray a 9x9 square baking pan with cooking spray, and line it with parchment if you want to be able to life the cake out for clean frosting. Turn the batter into the pan and bake for about 45 minutes, or just until a toothpick inserted in the center comes out without wet batter clinging to it. Don't over bake. Let the cake cool before frosting. To make the frosting, put the soft butter in a large bowl (use the same bowl, just give it a rinse and dry it.) Blend in the espresso powder, and then sift one cup of the sugar and the cocoa powder on top and begin to beat, slowly at first. Sift in the rest of the sugar while beating, along with enough cream to thin the frosting to a spreadable consistency. Add the vanilla and beat until everything is smooth.